Each day of dog walking through life with my hound dog Valentino proves to be a learning experience for the both of us. My dog and I are now on a stay healthy adventure together. 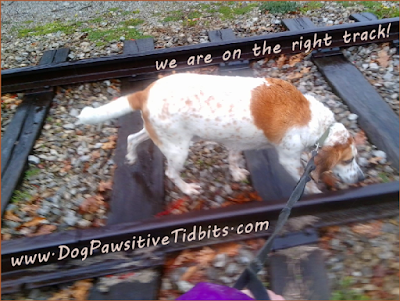 My dog Valentino and I are on the right track, naturally! We are hoping to stay on the right track by eating healthier. Of course, as I add more healthy foods to my own meals I will also adhere to the plan to "Feed Your Best Friend Better" by whipping up more nutritious meals and dog treats for Valentino. How do you stay on track with your dog for better health? Naturally, we add a bit of fun to our dog days and this includes hopping along with BlogPaws on Wordless Wednesday. Come join the blog hop with your pets each week!